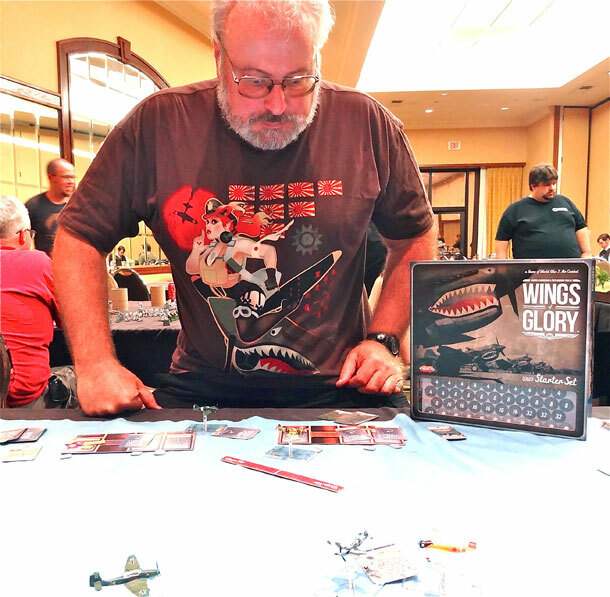 Kevin Duke, a long time player and supporter of the Wings of War/Wings of Glory game system, took part at the MidSouthCon and brought with him the first Wings of Glory releases – the WW2 Starter Set and the eight WW2 Airplane Packs to run volunteer demo sessions there. You can read below the report he wrote about the weekend with some pictures taken in the event. “A friend and I ran two sessions of Wings of Glory at the MidSouth Con event, in Memphis, Tennessee over the weekend of March 23-25. We scheduled both events for the evenings, when we could play as late as folks wished to. We made a point of using the new Wings of Glory planes to show everyone that they were available. 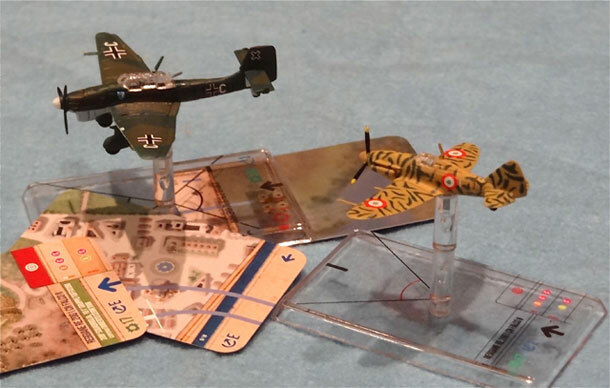 The “mix” of planes in the Starter Pack is…interesting, in a historical sense. To add additional elements to the table, we also pulled some planes out of Wings of War Series 2. 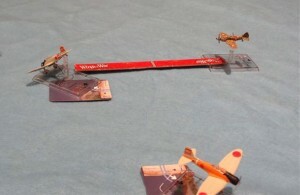 Our first scenario was “Axis vs Allies.” For the Allies, we used 2 of the P-40s a Yak, and the Allied Falco. By the way, the P-40s were easily the most popular planes in the series, based on preference from folks who know about planes to simple “I like the way they look” from folks who don’t know very much about planes. The Axis powers got 2 of the Tonys (Ki-61s), both Falcos, and we gave them a Stuka and a Val (to be operated automatically) as something to attack/defend outside of just having fighters roaring around. It worked very nicely, and a late arrival took over these two planes. We explained that he was the “flying targets” but he said, “That is okay—I like being the center of attention.” He was. We had many very new players—both new to the system and new to… well, new to the subtle concepts of “World War 2,” in terms of what countries were fighting. 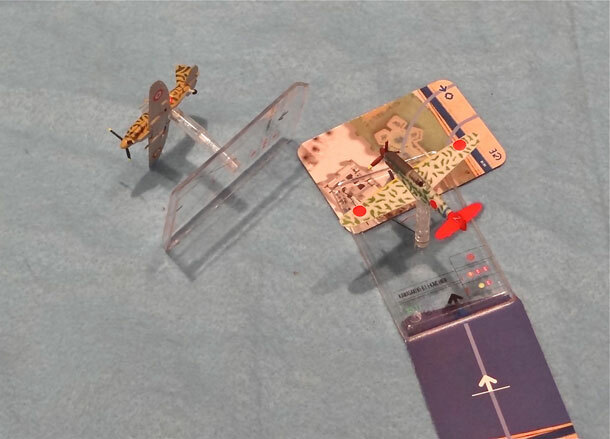 Some found it very difficult to tell the Japanese planes from the Soviet planes, in terms of “do I shoot at that or not?” We made an adjustment for Round 2. First kill of the Friday demo at MidSouth Con. Allied Falco finishes off a Val. Round 2 went non-historical but simple—“Planes with red markings against planes without red markings.” This combined the Japanese and Soviet planes against virtually everyone else. We aimed for equal strength sides (this time the Stuka was on one side and the Val on the other). Or so we thought—we were all in for a surprise. We wished to showcase as many of the planes as possible so rotated in some new models but using the same maneuver deck. Our first two “Tony” fighters were the light gray one and the one with spots. We pulled out the light gray one (for looking too much like the Val) and put the green Tony in. We were familiar with A, B, and C damage. When I first saw the “D” damage chits, I thought they must be ground AA or something like that. Then we noted that the green Tony is armed differently from the other two, and added a new cup to contain the D damage chits. I took a look at these as I punched them out and added them to the cup. I expected more ‘zero’ results and some larger hits of point damage. I WAS RIGHT! But far more than I expected. Wow—seeing an “18” point damage chit really gets your attention! Seeing a couple 12 chits was impressive too. People quickly realized what a brute this plane was and spent a major portion of their time just trying to pay attention to it and stay far away. Saturday: the Allied Falco chases a Stuka. The Tony rescues the Stuka. It makes for a fun end to the evening. All in all, we were able to get all 12 of the new planes on the board. We were so caught up with directing (and helping new players) that we did not get very many photos. Next time we’ll do better. All in all, the new planes are very sharp to look at. The two Axis Falcos are a little bit too much alike (we avoided putting both on the board at the same time) but the others are very distinguished. The new rules move smoothly and everyone had a good time. We did attract some spectators as well, a number of whom asked about the WW1 bombers. People are anxious for those too!